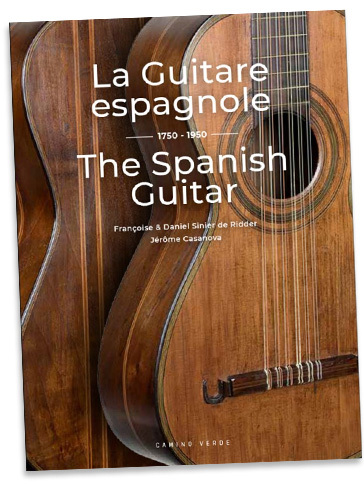 This book written by Francoise de Ridder, Daniel Sinier and Jerome Casanova recounts the history of the Spanish guitar since its origins until 1950.
typical of an era, a repertoire but especially a country and a culture. We see in particular the guitars of Durán, Sanguino, Pagés, Benedid, Pernas, Torres, Santos Hernandez, Fleta. Françoise de Ridder, Daniel Sinier and Jérôme Casanova share their passion and years of experience. 225 x 300mm, 208 pages, 420 photos. Chronicle for the exhibition "Faszination Gitarre"
Lecture given at Cremona for the 2010 edition of Mondomusica, the worldwide leading marketplace for violin and plucked instrument making. in Mirecourt November 22, 2003, for the "GLAAF". Groupement des Luthiers et Archetiers d'Art de France. "The restoration of antique instruments: deontologies and strategies" (PDF). "Restoration of a Michelot late baroque guitar". American lutherie #101 Spring 2010 issue. modification of a lute made by Tiefembruker 1575. "Pons, the "Lupot" of the guitar"
Pons brothers, the real creators of the romantic guitar. "Nicolas Grobert, a discreet luthier"
and Berlioz played and signed it, Nicolas Grobert is maybe the most copied of the guitar-makers. Classical guitar , volume 28, n°6, february 2010. Exhibition of historic guitars in Alessandria – Italy. 20th septembre -19th october 2008.
" The appraisal and restoration of a guitar ascribed to Matteo Sellas, Venice c.1640"
Classical guitare volume 26, n°2, october 2007. "Restoring a Guitar by Leonhard Pratter, Prague 1676: A Luthier's Report"
"Guitares de Mirecourt, guitares oubliées"
Les cahiers de la guitare et de la musique, 1999.